‘Great music and a wonderful way to spend the afternoon’ George Coote. Indeed correct George! A Sunday afternoon at The Vortex listening up close and personal to some great musicians soothes all savage breasts. Doors open at 2.00 pm. Full details in the footer below. The New Zealand based violinist and London based guitarist renew their partnership in a duo that promises to further enlarge upon their shared delight with the process and practices of free improvisation. An initial inspiration and driving force that was nurtured in the workshops of Eddie Prevost. Catch them while you can. A welcome return for two Mopomoso favourites here for the first time as a duo. 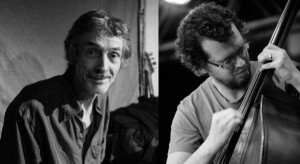 Both musicians are highly regarded members of the improvising community, both here and abroad, where they lend their respective talents to a wide range of groups and projects. Promises to be a lot of fun! The remarkable and diverse talents of Tania Chen, here on a visit from the US, meet those of the redoubtable guitarist John Russell. Again a debut duo performance, Tania and John played together at The Vortex in Fete Quaqua 2010. The range of options open for the musicians is so large it is impossible to predict what the resulting music might be but, suffice to say, it will be nothing less than a fully engaging experience based upon close listening and an openness to a shared musical experience.